Tim Rogers….banjo, fiddle mandolin… Brian Lofthouse ….guitar and mandolin… Dearbhla Ryan…string bass… Dan Delaney…fiddle, charango. 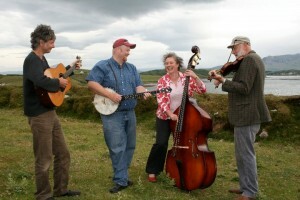 Formed in February 2010, Tim Rogers and The Clew Bay Critters Are a stringband based in Westport County Mayo.. They play a good timey mix of Old time songs, wild fiddle tunes, acoustic swing and bluegrass standards.